(CNN) -- Premier League side Liverpool's American owners have concluded a deal to re-finance the bank loan they took out to buy the club in 2007. 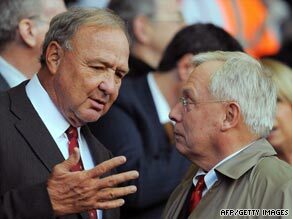 Hicks (left) and Gillett have refinanced the bank loan they took out to buy Liverpool in 2007. Co-owners Tom Hicks and George Gillett are not expected to issue a statement, but the deal is believed to be for another year and will involve them paying back £60 million ($99m) of the original debt. Negotiations between the Royal Bank of Scotland, Wachovia and the owners have continued for months amid the backdrop of the worldwide credit crunch, which has affected negotiations. There had been real fear that the banks would call in the loan, while both Hicks and Gillett have searched for someone to take a minority stake in the club for around £100m ($165m) to no avail. The owners have reduced the £290m ($478.5m) they owed to £230m ($379.5m), with £60m ($99m) being repaid, half immediately. Hicks, 63, and Gillett, 70, purchased Liverpool in 2007 for £174m ($287m), taking on £44.8m ($74m) of liabilities and maintained that financing the debt would not fall on the club. But that attitude changed, and Liverpool now have to find around £40m ($66m) a year to service the debt, a situation that has enraged fans' groups and impacted on manager Rafael Benitez's transfer budget. The owners have also failed to find the money to build the club's new stadium with preliminary work on the Stanley Park venture halting during last season. Rogan Taylor, spokesman for the ShareLiverpool group who re-launched their own takeover plans for the club last week, told Press Association Sport: "The re-financing deal we are hearing about is really what we expected. "It is little more than an expensive fix -- just a sticking plaster -- and making things more difficult for the club to progress in the long run. It is still very short term, year to year, and the owners are not able to take the club forward."